Generally, the Chicago Harbor comprises the public rivers, canals, and lakes within the territorial limits of the City of Chicago and all connecting slips, basins, piers, breakwaters, and permanent structures therein for a distance of three miles from the shore between the extended north and south lines of the city. The greater Chicago Harbor includes portions of the Chicago River, the Calumet River, the Ogden Canal, the Chicago Sanitary and Ship Canal, Lake Calumet, and Lake Michigan.In a more narrow sense, the Chicago Harbor is that artificial harbor on Lake Michigan located at the mouth of the Chicago River bounded by outer breakwaters to the north and east, Northerly Island to the south, and the Chicago shoreline to the west. The main entrance to this harbor is marked by the Chicago Harbor Lighthouse. The Jardine Water Purification Plant, Navy Pier, the Chicago Harbor Lock, Coast Guard Station Chicago, the municipal harbors - Dusable Harbor and Monroe Harbor, and the yacht clubs - Chicago Yacht Club and Columbia Yacht Club are all located here.The Port of Chicago is located within the greater Chicago Harbor in and around Calumet Harbor, the Calumet River, and Lake Calumet. The Chicago Park District operates a municipal harbor system within the greater Chicago Harbor in Lake Michigan for recreational boaters. With accommodations for 6000 boats, it is the largest system of its kind in the nation. The system comprises (from north to south) Montrose Harbor, Belmont Harbor, Diversey Harbor, Dusable Harbor, Monroe Harbor, Burnham Harbor, 31st Street Harbor, 59th Street Harbor, and Jackson Park Inner and Outer Harbors. The Chicago River is a system of rivers and canals with a combined length of 156 miles (251 km) that runs through the city of Chicago, including its center (the Chicago Loop). Though not especially long, the river is notable because it is one of the reasons for Chicago's geographic importance: the related Chicago Portage is a link between the Great Lakes and the Mississippi River Basin, and ultimately the Gulf of Mexico. The River is also noteworthy for its natural and human-engineered history. In 1887, the Illinois General Assembly decided to reverse the flow of the Chicago River through civil engineering by taking water from Lake Michigan and discharging it into the Mississippi River watershed, partly in response to concerns created by an extreme weather event in 1885 that threatened the city's water supply. In 1889, the Illinois General Assembly created the Chicago Sanitary District (now The Metropolitan Water Reclamation District) to replace the Illinois and Michigan Canal with the Chicago Sanitary and Ship Canal, a much larger waterway, because the former had become inadequate to serve the city's increasing sewage and commercial navigation needs. Completed by 1900, the project reversed the flow of the Main Stem and South Branch of the Chicago River by using a series of canal locks and increasing the flow from Lake Michigan into the river, causing the river to empty into the new Canal instead. In 1999, the system was named a 'Civil Engineering Monument of the Millennium' by the American Society of Civil Engineers (ASCE).The river is represented on the Municipal Flag of Chicago by two horizontal blue stripes. Its three branches serve as the inspiration for the Municipal Device, a three-branched, Y-shaped symbol that is found on many buildings and other structures throughout Chicago. The Door Peninsula is a peninsula in eastern Wisconsin, separating the southern part of the Green Bay from Lake Michigan. The peninsula begins in northern Brown and Kewaunee counties and proceeds northeast to include all of Door County. It is the western portion of the Niagara Escarpment. Well known for its cherry and apple orchards, the Door Peninsula is a popular tourism destination. With the 1881 completion of the Sturgeon Bay Ship Canal, the northern half of the peninsula became an island.Limestone outcroppings of the Niagara Escarpment are visible on both shores of the peninsula, but are larger and more prominent on the Green Bay side as seen at the Bayshore Blufflands. Progressions of dunes have created much of the rest of the shoreline, especially on the easterly side. Flora along the shore provides clear evidence of plant succession. The middle of the peninsula is mostly flat, cultivated land. Beyond the northern tip of the peninsula are a succession of islands, the largest of which is Washington Island. The partially submerged ridge extends farther north, becoming the Garden Peninsula in Upper Michigan. The Great Lakes (French: les Grands-Lacs), also called the Laurentian Great Lakes and the Great Lakes of North America, are a series of interconnected freshwater lakes primarily in the upper mid-east region of North America, on the Canada–United States border, which connect to the Atlantic Ocean through the Saint Lawrence River. They consist of Lakes Superior, Michigan, Huron, Erie, and Ontario, although hydrologically, there are four lakes, Superior, Erie, Ontario, and Michigan-Huron. The connected lakes form the Great Lakes Waterway. The Great Lakes are the largest group of freshwater lakes on Earth by total area, and second-largest by total volume, containing 21% of the world's surface fresh water by volume. The total surface is 94,250 square miles (244,106 km2), and the total volume (measured at the low water datum) is 5,439 cubic miles (22,671 km3), slightly less than the volume of Lake Baikal (5,666 cu mi or 23,615 km3, 22–23% of the world's surface fresh water). Due to their sea-like characteristics (rolling waves, sustained winds, strong currents, great depths, and distant horizons) the five Great Lakes have also long been referred to as inland seas. Lake Superior is the second largest lake in the world by area, and the largest freshwater lake by area. Lake Michigan is the largest lake that is entirely within one country.The Great Lakes began to form at the end of the last glacial period around 14,000 years ago, as retreating ice sheets exposed the basins they had carved into the land which then filled with meltwater. The lakes have been a major source for transportation, migration, trade, and fishing, serving as a habitat to a large number of aquatic species in a region with much biodiversity. The surrounding region is called the Great Lakes region, which includes the Great Lakes Megalopolis. The Great Lakes Circle Tour is a designated scenic road system connecting all of the Great Lakes and the St. Lawrence River. It consists of routes for circumnavigating the lakes, either individually or collectively. Green Bay is an arm of Lake Michigan, located along the south coast of Michigan's Upper Peninsula and the east coast of Wisconsin. It is separated from the rest of the lake by the Door Peninsula in Wisconsin, the Garden Peninsula in Michigan, and the chain of islands between them, all formed by the Niagara Escarpment. Green Bay is some 120 miles (193 km) long, with a width ranging from about 10 miles (16 km) to 20 mi (32 km). It is 1,626 square miles (4,210 km2) in area. At the southern end of the bay is the city of Green Bay, Wisconsin, where the Fox River enters the bay. The Leo Frigo Memorial Bridge (formerly known as the Tower Drive bridge) spans the point where the bay begins and the Fox River ends, as the river flows south to north into the bay. Locally, the bay is often called the Bay of Green Bay to distinguish the bay from the city. The bay is navigable by large ships. The bay is located in parts of five counties in Wisconsin (Brown, Door, Kewaunee, Marinette, Oconto), and two in Michigan (Delta, Menominee). Holland is a city in the western region of the Lower Peninsula of the U.S. state of Michigan. It is situated near the eastern shore of Lake Michigan on Lake Macatawa, which is fed by the Macatawa River (formerly known locally as the Black River). Holland is the largest city in Ottawa County, and as of 2013 part of the Grand Rapids-Wyoming-Muskegon Metropolitan Statistical Area. Holland was founded by Dutch Americans, and is in an area that has a large percentage of citizens of Dutch American heritage. It is home to Hope College and Western Theological Seminary, institutions of the Reformed Church in America. In February of 1996 the Holland City Council approved a sister city relationship between Santiago de Querétaro, Querétaro, Mexico and the City of Holland, Michigan, USA. Adeline Jay Geo-Karis Illinois Beach State Park is part of the Illinois state park system and is located along Lake Michigan in Winthrop Harbor, Zion, and unincorporated Benton Township in northeast Illinois. Together with lands to the north, including Chiwaukee Prairie, it forms the Chiwaukee Illinois Beach Lake Plain, an internationally recognized wet-land under the Ramsar Convention. The park is broken into two units that encompass an area of 4,160 acres (1,683 ha) and contains over six miles of Lake Michigan shoreline. Recreational activities at Adeline Jay Geo-Karis Illinois Beach State Park include boating, swimming, hiking, bicycling, camping, bird watching, and picnicking. Known primarily for the beach, Adeline Jay Geo-Karis Illinois Beach State Park also includes dune areas, wetlands, prairie, and black oak savanna. The area at the far southern end of the park is a designated nature preserve, which was named a National Natural Landmark in 1980. Lake Chicago was a prehistoric proglacial lake that is the ancestor of what is now known as Lake Michigan, one of North America's five Great Lakes. Lake Michigan–Huron (also Huron–Michigan) is the combined waters of Lake Michigan and Lake Huron, which are joined through the 5-mile (8.0 km) wide, 20-fathom (120 ft; 37 m) deep, open-water Straits of Mackinac. Huron and Michigan are hydrologically a single lake because the flow of water through the straits keeps their water levels in near-equilibrium. (Although the flow is generally eastward, the water moves in either direction depending on local conditions.) Combined, Lake Michigan–Huron is the largest fresh water lake by area in the world. However, if Lake Huron and Lake Michigan are considered two separate lakes Lake Superior is larger than either. The beaches in Chicago are an extensive network of waterfront recreational areas operated by the Chicago Park District. The Chicago metropolitan waterfront includes parts of the Lake Michigan shores as well as parts of the banks of the Chicago, Des Plaines, Calumet, Fox, and DuPage Rivers and their tributaries. The waterfront also includes the Illinois and Michigan Canal and the Sanitary and Ship Canal. Historically, the waterfront has been used for commerce, industry, and leisure. Leisure, such as fishing, swimming, hunting, walking and boating, was much more prevalent throughout the river sections of the waterfront system early in the 19th century before industrial uses altered the landscape. By midcentury, much leisure shifted to Lake Michigan as a result of industrial influence. The first City of Chicago Public Beach opened in Lincoln Park in 1895. Today, the entire 28 miles (45 km) Chicago lakefront shoreline is man-made, and primarily used as parkland. There are twenty-four beaches in Chicago along the shores of freshwater Lake Michigan.Typically, Chicago beaches take the name of the east-west street that runs perpendicular to the lake at each beach's location. Ludington is a city in the state of Michigan. As of the 2010 census, the city population was 8,076. It is the county seat of Mason County.Ludington is a harbor town located on Lake Michigan at the mouth of the Pere Marquette River. Many people come to Ludington year round for recreation, including boating and swimming on Lake Michigan, Hamlin Lake, and other smaller inland lakes, as well as hunting, fishing, and camping. Nearby are Ludington State Park (which includes the Big Sable Point Light), Nordhouse Dunes Wilderness, and Manistee National Forest. Ludington is also the home port of the SS Badger, a vehicle and passenger ferry with daily service in the summer across Lake Michigan to Manitowoc, Wisconsin. Watching the Badger come into port in the evening from the end of the north breakwall by the Ludington lighthouse is a favorite local pastime. Ludington has multiple golf and disc golf courses, attracting numerous players. In summer, the city hosts quite a few large events. Examples are one of the largest Gus Macker basketball tournaments (with 35,500 spectators), the Ludington Area Jaycees Freedom Festival (July 4), the Lakestride Half Marathon in June, and the West Shore Art League's Art Fair. As a result of its many attractions (based on AAA's 2005 TripTik requests), Ludington is the fifth-most-popular tourist city in Michigan, behind Mackinaw City, Traverse City, Muskegon, and Sault Ste. Marie. Michigan City is a city in LaPorte County, Indiana, United States. It is one of the two principal cities of the Michigan City-La Porte, Indiana Metropolitan statistical area, which is included in the Chicago-Naperville-Michigan City Combined statistical area. Located in the region known to locals as Michiana, it is approximately 50 miles east of Chicago and 40 miles west of South Bend. The city had a population of 31,479 at the 2010 census. Michigan City is noted for both its proximity to Indiana Dunes National Park and for bordering Lake Michigan. Due to this, Michigan City receives a fair amount of tourism during the summer months, especially by residents of Chicago and of nearby cities in Northern Indiana. The lighthouse is a notable symbol for the city and is incorporated in the heading of Michigan City's sole newspaper, The News Dispatch, and the city's official seal. Michigan City hosted the sailing events at the 1987 Pan American Games. SS Badger is a passenger and vehicle ferry in the United States that has been in service on Lake Michigan since 1953. Currently, the ship shuttles between Ludington, Michigan, and Manitowoc, Wisconsin, a distance of 62 miles (100 km) , connecting U.S. Highway 10 (US 10) between those two cities. It is the last coal-fired passenger vessel operating on the Great Lakes, and was designated a National Historic Landmark on January 20, 2016. The ship is named after the University of Wisconsin's athletic teams, the Wisconsin Badgers. Badger runs on Michigan time (Eastern Time Zone, whereas Wisconsin is in the Central Time Zone) and riders pay Michigan taxes on their fares. It runs on a seasonal basis from May to October. The SS Spartan is a railroad car ferry on Lake Michigan owned by the Chesapeake and Ohio Railway (C&O) from 1952 through 1979. It alternated routes from Ludington, Michigan, to Milwaukee, Kewaunee, and Manitowoc, Wisconsin. Silver Lake State Park is a public recreation area covering 2,936 acres (1,188 ha) bordering Lake Michigan and Silver Lake near Mears in Oceana County, Michigan. The state park is composed of mature forest land and over 2,000 acres (810 ha) of sand dunes. The park is 1.5 miles (2.4 km) wide and 3 miles (4.8 km) long and is divided into three segments: The northern area is an all-terrain vehicle dunes area where private motorized vehicle may be driven, the middle of the park is a non-vehicle area (the Walking Dunes), and the southernmost section is leased to a private operator. The park grounds include the Little Sable Point Light on Lake Michigan and one mile of shoreline on 690-acre (280 ha) Silver Lake. The St. Joseph River (known locally as the St. Joe) is a 206 miles (332 km) long tributary of Lake Michigan flowing generally westerly through southern Michigan and northern Indiana, United States, to its terminus on the southeast shore of the lake. It drains a primarily rural farming area in the watershed of Lake Michigan. 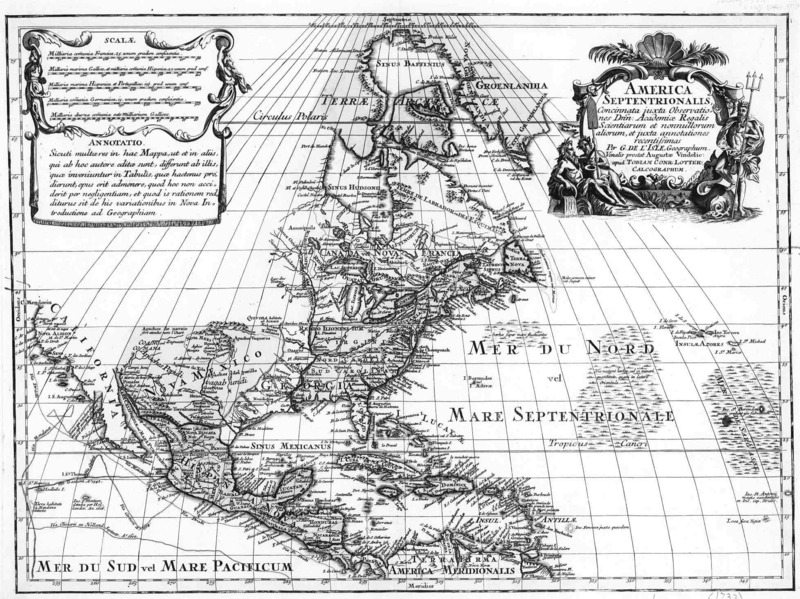 It was enormously important to Native Americans and greatly aided in the colonial exploration, settlement and administration of New France and the nascent United States as a canoe route between Lake Michigan and the watershed of the Mississippi River. The Straits of Mackinac ( MAK-in-aw) are narrow waterways in the U.S. state of Michigan between Michigan's Lower and Upper Peninsulas. The main strait flows under the Mackinac Bridge and connects two of the Great Lakes, Lake Michigan and Lake Huron. The main strait is 3.5 miles (5.6 km) wide and has a maximum depth of 295 feet (90 m). Hydrologically, the two connected lakes can be considered one lake, which is called Lake Michigan–Huron. Historically, the native Odawa people called the region around the Straits Michilimackinac. 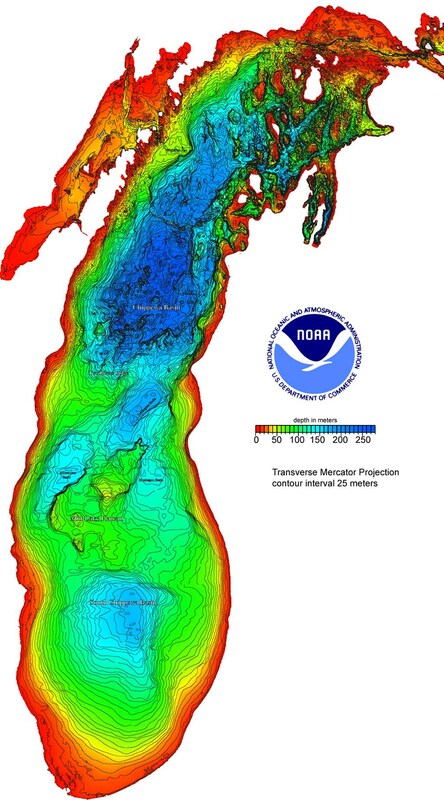 The Straits of Mackinac is "whipsawed by currents unlike anywhere else in the Great Lakes".Islands forming the edge of Straits of Mackinac include the two populated islands, Bois Blanc and Mackinac, and one that is uninhabited: Round island. The Straits of Mackinac is a major shipping lane, providing passage for raw materials and finished goods and connecting, for instance, the iron mines of Minnesota to the steel mills of Gary, Indiana. Before the railroads reached Chicago from the east, most immigrants arrived in the Midwest and Great Plains by ships on the Great Lakes. The straits is five miles (8 km) wide at its narrowest point, where it is spanned by the Mackinac Bridge. Before the bridge was built, car ferries transported vehicles across the straits. Today passenger-only ferries carry people to Mackinac Island, which does not permit cars. Visitors can take their vehicles on a car ferry to Bois Blanc Island. The straits are shallow and narrow enough to freeze over in the winter. Navigation is ensured for year-round shipping to the Lower Great Lakes by the use of icebreakers. The straits were an important Native American and fur trade route. The Straits of Mackinac are named after Mackinac Island. The local Ojibwe Native Americans in the Straits of Mackinac region likened the shape of the island to that of a turtle, so they named the island Mitchimakinak, meaning "Big Turtle". When the British explored the area, they shortened the name to its present form: Mackinac.Located on the southern side of the straits is the town of Mackinaw City, the site of Fort Michilimackinac, a reconstructed French fort founded in 1715, and on the northern side is St. Ignace, site of a French Catholic mission to the Indians, founded in 1671. The eastern end of the straits was controlled by Fort Mackinac on Mackinac Island, a British colonial and early American military base and fur trade center, founded in 1781.